I apologize for not sharing my findings on Ancestry with you all before today. I spent most of Friday printing and organizing the documents and this weekend has be hectic – but fear not! I have not forgotten our Mesier adventure. First of all, my main objective was to gather a solid genealogy of the Mesiers who were most closely associated with the Homestead. While it is important and nice to have a comprehensive genealogy of all the Mesier descendants, it’s equally important to stay focused. This focus is on the Mesiers who occupied the home and those last few who were involved in selling the home to the town in 1892 (besides the Mesier/Reese descendants).This is the premise of the project for now, and down the road we can tackle the task of an all-inclusive genealogy. I want to start with what has been found concerning our original settler, Peter Jansen Mesier. There are a few variations of this name that came up often in my searches – the first name either being Peter or Pieter, middle as Jansen or Janssen or Janse or Janzen or Janszen, and last either as Mesier or Messier. Also, we are dealing with a lot of Peters, so I’m going to refer to him as Peter J. Mesier. Peter J. Mesier was born in France, as one document suggests, and apparently immigrated from Holland (Amsterdam) to New York (then New Netherlands/Amsterdam) in the 1660s. I won’t stand by that estimate with certainty, as there are some conflicts in the documents I’ve found. One magazine article cites the first Mesier coming to New York in 1685, which I am fairly certain is inaccurate since we have other primary source records that contradict this. 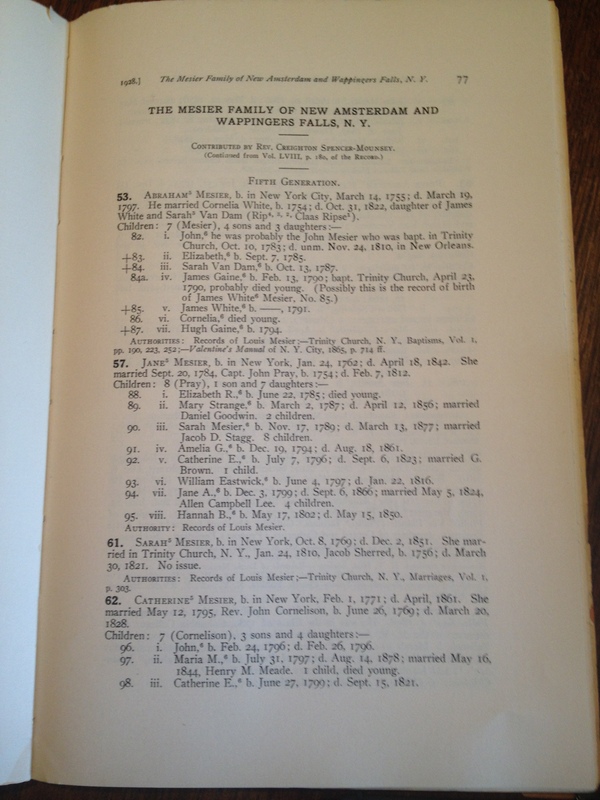 The Court Minutes of New Amsterdam1 are going to be our best source regarding this fact, and the earliest (that I’ve found) indication of there being a Peter Mesier in New York is in 1673. Yet, from this document I believe we can assume that Peter arrived even earlier than that, since the record orders Peter’s, among other settlers’, “houses, gardens, and orchards” to be “burnt and demolished” as to better defend the fortification. Therefore, we might be able to assume that, since it Peter had established property, he was settled there earlier than 1673. 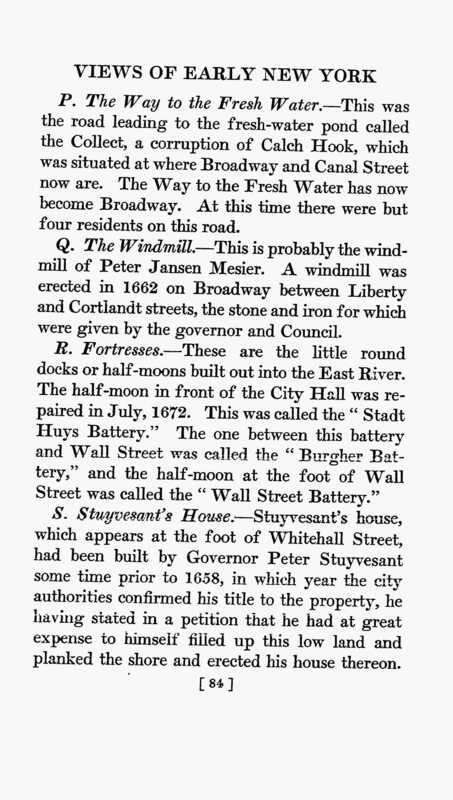 There is also a document from Views of Early New York that references one of the first maps drawn of the fort (Allard’s map of New Amsterdam) and writes of Peter’s windmill being erected in 1662. This is not a primary source but it may be accurate in citing one (Allard’s map). I’m working on finding a copy of Allard’s map to see what exactly this book is referencing. The Court Minutes of New Amsterdam also give us clues as to what Peter’s roles were and how active he was in the community – but I want to organize those a little better before I share them here. 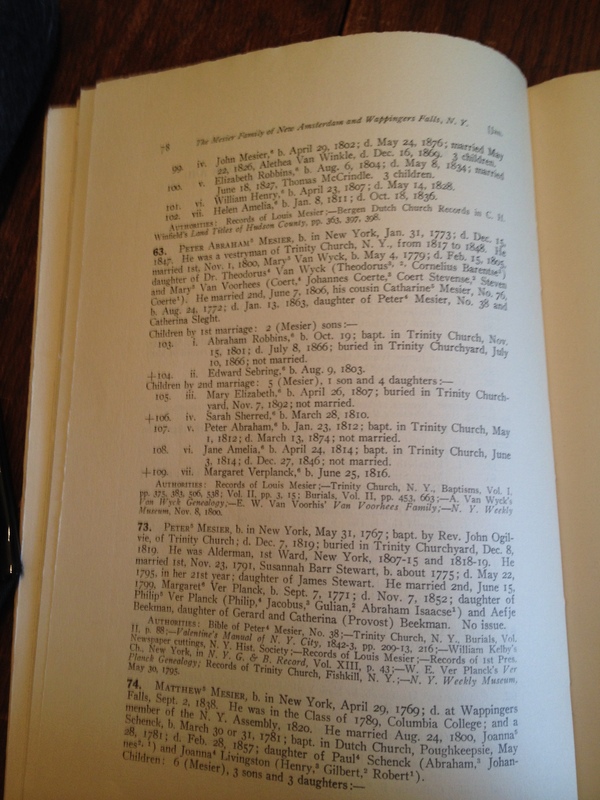 I’m also working on finding documents concerning Peter J. Mesier’s heritage in Normandy and his excursion to New York. That may take a little more time, but I’ve found some leads that may give us further details about his immigration(s). I can’t be thankful enough – or enthused enough – that our Peter J. Mesier was among those original settlers in New Amsterdam because we have an great amount of primary sources that document the everyday life and activity in the fort. Same goes for his grandson, Peter Mesier (the first Mesier resident at the Homestead), whom we have a plethora of information on. It makes for an interesting, exciting history in regards to the Mesiers! Ah! I’m glad I get to do this every day. In my next post I’ll continue with Peter J. Mesier’s son, also Peter. I’m going to divide my research in this way because, as you can gather, there is a lot of information to share and I would hate for my readers to feel overwhelmed by the density of each post. I want you all to love every bit of the Mesier Project as much as I do. As you can imagine, researching takes a lot of time! Not only that, once there is enough material on hand to write about, it still needs to be organized. I spent my time today doing that as well as continuing research on Ancestry, so I don’t have much to share today. Well, I have a lot to share – it’s just not ready! Other than that, today was a lively day at the homestead. Beth, Trish, Jackie, Sandra were all there this morning sharing some findings, archiving, and discussing our projects. I have to say the most exciting part about today was seeing what Sandra found on eBay! 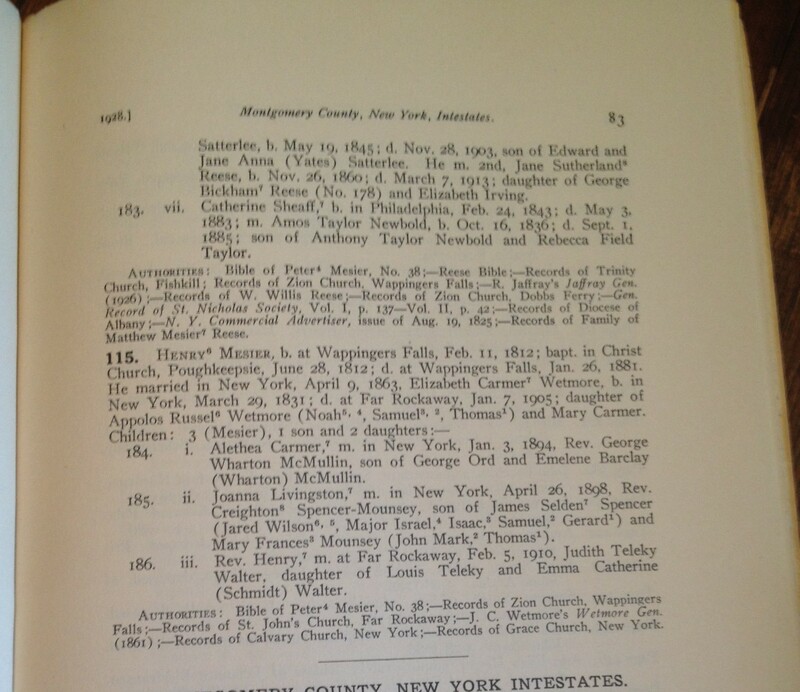 She found a genealogy of some families from Dutchess county which included the Mesiers (and all the way back to Peter J. Mesier). 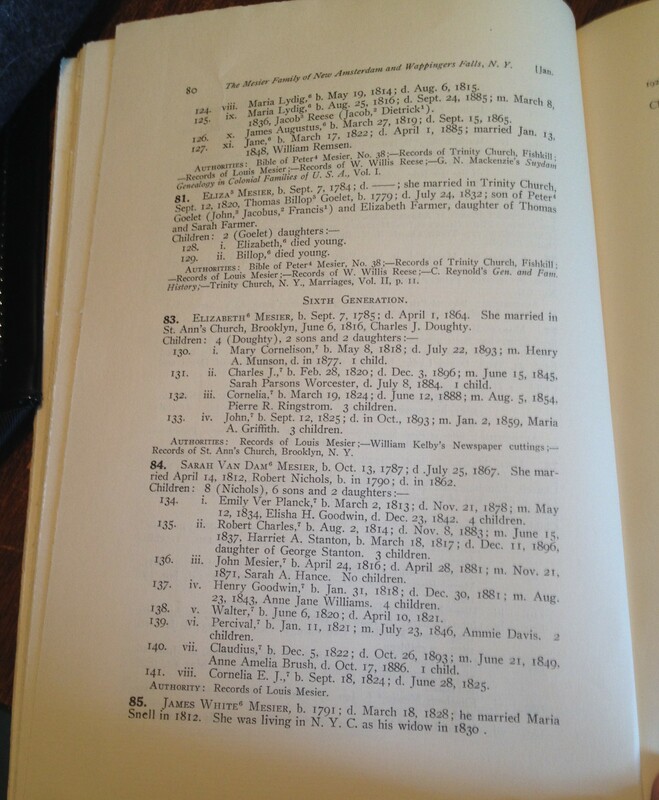 I was so, so, so excited to be able to fill in some dates on our Mesier family tree and confirm some information that we already had (marriages, births, etc). We did notice that a few Mesiers were missing and realized the we had the second volume of the book, so now we are on a quest for the first! Sandra, you are amazing! I took some pictures of what the book contains, and you can see how valuable the information is for yourself! There’s one page missing, which is 82. I must have forgotten to take a picture of it. I’ll update this post with it next time I’m at the house. WOW – do I have a lot of share with you all today! I started the day with Jackie, as planned, and we spend over two hours driving around Wappingers. Being completely ignorant of the town’s topography, every street, house, and park was new to me. I was delighted, each time we stopped somewhere of importance, to construct a comprehensive vision of of the places that always come about during my research. I finally know where Stony Co., the bleachery, and Sweet Orr were. It’s fascinating how these industrial factories/quarry influenced the general make of the town. Whole areas in the village were developed as housing for the many workers of these industries, and thus were the first real streets and “heavy” residential areas formed. Most of these duplexes and homes are still up and occupied. Therefore, t’s incredible how easy it is, given the almost identical original layout, to imagine how the town looked and felt when industry had a stronghold here. There are so many other places we stopped at that aren’t listed here, but I’m sure throughout my blog I’ll reference some of the areas I saw and learned about today. I’ve also edited the Greenway map to show were the bleachery and Sweet Orr were; highlighted in purple represents housing projects for workers of these factories. You should all travel the Greenway Trail! Being Wednesday, I had a lot of time after our tour to continue my research on the Mesiers. I am soooo, soooooo impatient to share with you all what I found on Ancestry.com – so many leads and so much new information! If I share it now, I’m afraid I’ll be premature since none of it is coherently organized and it would be appreciated more once organized. I’m going to hopefully get that out by tomorrow or Saturday! And now, it is bed time. Today was one of my shorter days at the homestead (Tuesdays and Fridays I’m here for only about three hours), and I let Jackie have my ear for a good amount of it. 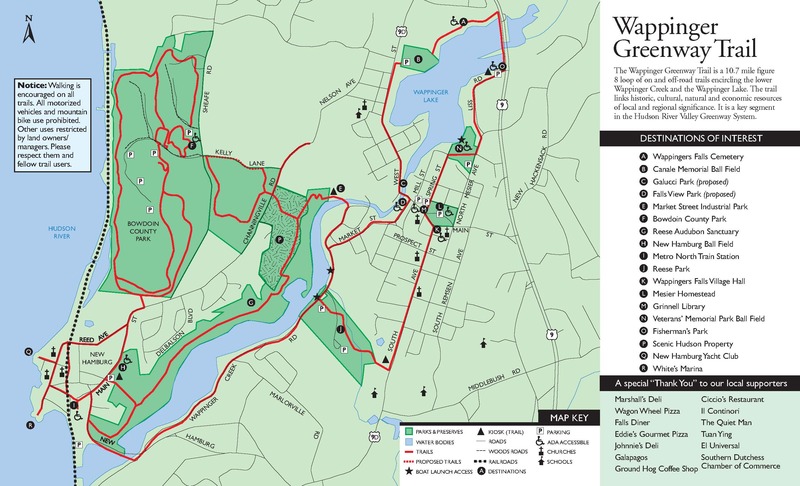 I’m so thankful that she’s a pretty common denominator here, because I, being new to not only to the homestead, but also to the history of Wappingers, have some catching up to do. Thus, having Jackie around is a great benefit to me because she grew up in the village and knows the area and a lot of its history. She’s been filling me in on whatever she knows and tries to answer my (frequent!) questions. After talking for a bit she suggested that tomorrow we go on a tour of the village and see some of the homes and streets that come up often in my research. I eagerly agreed, of course! It’d be nice to have an mental image of the village so I can better visualize and understand the information I’m reading about. I’m very excited for that! Further, Jackie has an Ancestry.com (with international access) membership which she offered to let me use. I’m ecstatic about this. I’m hoping it’ll allow me to verify and find some new information about our dear Mesiers. I want to have a concrete genealogy of the family which will in turn be a stable foundation for future research. Thank you, Jackie! Besides that, we also bounced a few ideas off each other for the Fall Festival which she, Trish (another volunteer here), and I are all working on. Mostly our goal is to gather some stories for the tour that we are planning on giving during the festival. That project seems to be moving along alright, and come October 18th, I think we’ll have some interesting stories to share about the village/homestead. First off, I want to share a picture of the Mesier Homestead. Reading over my first post I realized a major blunder of mine – I didn’t include a picture of the house itself! 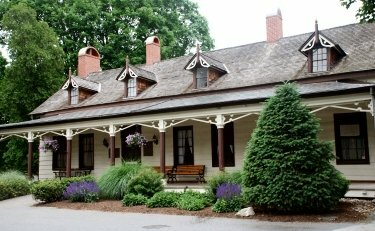 I want you all to see it: The picture does not do the house justice – come visit the park sometime! The homestead, and the park surrounding it, is so charming. I also wanted to include a post card drawing that’s a little more dated: I’m not sure when this this was drawn; definitely after 1891 when the house was sold. I’m tempted to say that this may closely resemble what the home looked like when the Mesiers actually occupied it. I’ll have to ask about this. Now that you know what the home looks like, I can rest assured! Today I was at the homestead for about three hours and spend about half that time further looking for things for the Fall Festival. One man, I forget his name, complied from the 1920s a whole lot of newspaper clippings from the town’s local paper. The stories he clipped where so cool – they consisted of civil disturbances, robberies, murders, runaways, etc. But I have to say my favorite clipping was a short two sentence blurb about the over night frost killing any flowers left outside and “making ill” the local farmer’s strawberry crops. Apparently a very note-worthy story! Jackie, a volunteer archivist with the society, and I talked about the style of journalism in the past and we both agree it is interesting the way they wrote. They wrote in a very colorfully, very opinionated, and the way in which the articles are written feels intimate, and almost reads as if the author were sharing with you a juicy bit of gossip. It’s extremely fun to read, and sometimes it’s shocking! I want to share some here, and Monday when I go back to the homestead I’ll make a note to take some pictures. I spent the rest of my time there today making a few calls. 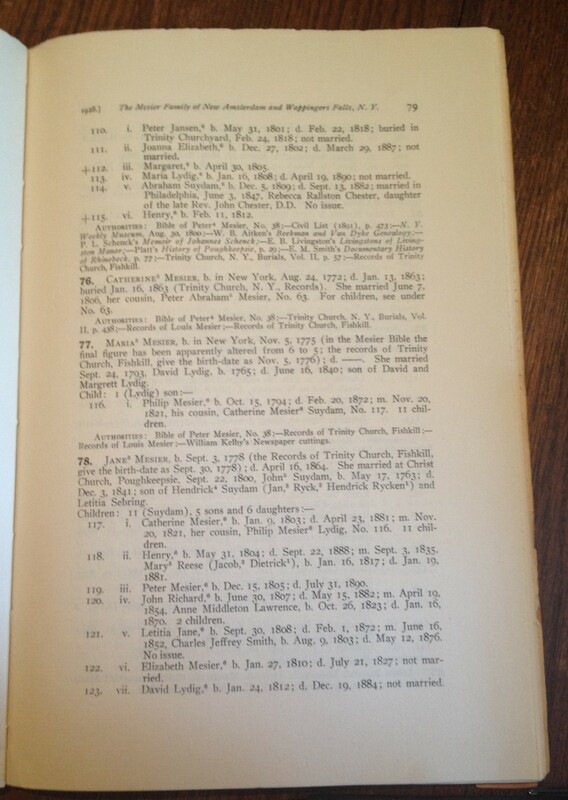 I wanted to get in contact with the Archives & Special Collections at Marist because Beth had already found some old letters and documents referring to the Mesiers there and supposedly there’s a lot there on the Mesier and Reese Family (descendants of the Mesiers). So I called John Ansley, the archive’s specialist there, and made an appointment to go there on the 10th of September, which I am so, so, so excited for. I also called Judy Capruso, archivist at the local history room at SUNY Ulster. I asked if maybe, by chance, there is something (anything!) regarding the Mesier’s in their collections. She agreed to take a look and will let me know if she finds anything. 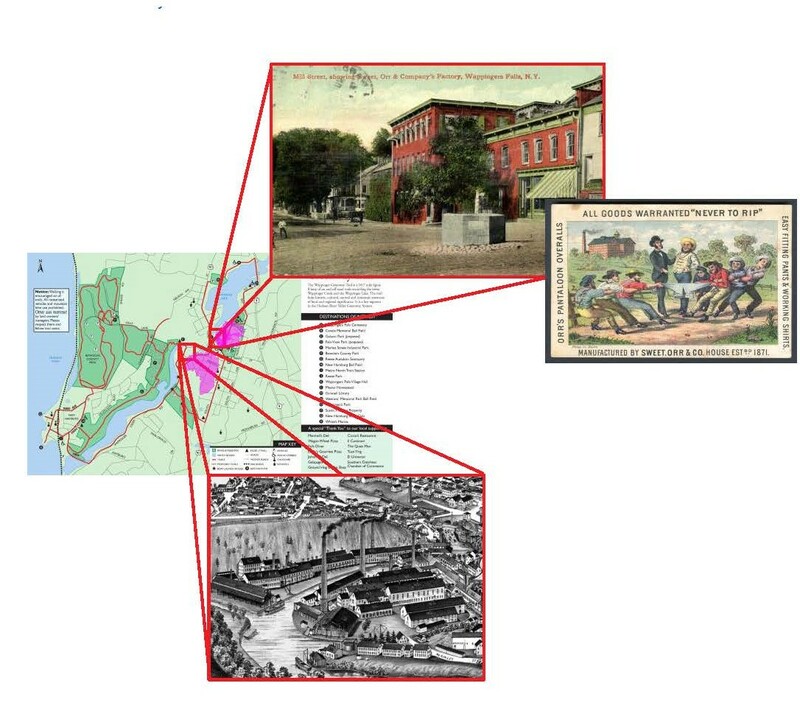 I’ve worked with Judy before on a few other local history projects (Ulster County history) and she is awesome and amazingly helpful; I’m happy to have contacted her again for some history sleuth work! Lastly, I called Vassar’s College, which I was told had a historical archive in their library. 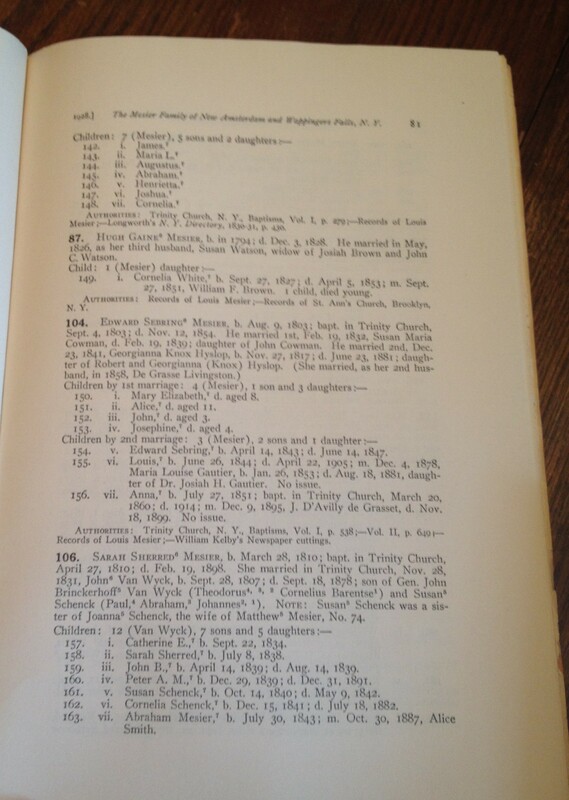 The specialist there, Dean Rogers, informed me that they mostly only collect histories regarding students and staff of the college, and it’s unlikely they have anything relative to the project if none of the Mesiers (or Reeses) attended the college. Nonetheless, he agreed to take a look for me. My goal is to get in contact with anyone/organization who might have information for me about the Mesiers. I want to find out about NYC Historical Societies and see if I can find some more clues about the first Mesiers of the Dutch Settlement in Manhattan. That would be awesome. Today was my second day at the homestead actually working on my internship project. Yes – that’s plural! Besides researching the Mesier Family, I will be helping find and organize stories for Haunted Hudson Valley’s Halloween Festival. The festival is going take place at the Mesier Park (where, obviously, our little homestead is nestled) and the homestead will be open for tours from 11am until 5pm. I’m really excited for this event. It’s the kind of event where perhaps people who aren’t generally interested in the town’s history or the homestead can be exposed to it in a fun way. When history is “fun” (it’s always fun! but sometimes it has to be a little extra fun to spark peoples’ interest), people want to learn more. And when they learn more, they appreciate the town that much more – which they should! We live in an area rich with an amazing, fascinating history, and I want everyone to know and love it (a girl can dream, can’t she?). Before I dive right in, I wanted to share my goals in creating this blog. First of all, I want a documented experience of my internship so I can reflect back on my findings. By doing this, I hope to organize my thoughts and ideas about the project and have a clear sense each day of how I am progressing. Sometimes when you lock your thoughts up in your head, you may think they make sense, but when you go to formally write them down you find that perhaps you don’t know all that you thought you knew! Or, maybe you do, but writing develops that further. This happens to me pretty often, thus the creation of this blog. And, most importantly, I want to share everything I find with anyone whose interested in knowing more about local history and the roles our ancestral neighbors played in the past. It’s so cool, so intimate, and so important that it definitely needs to be shared. That being said, Forward in all Directions! 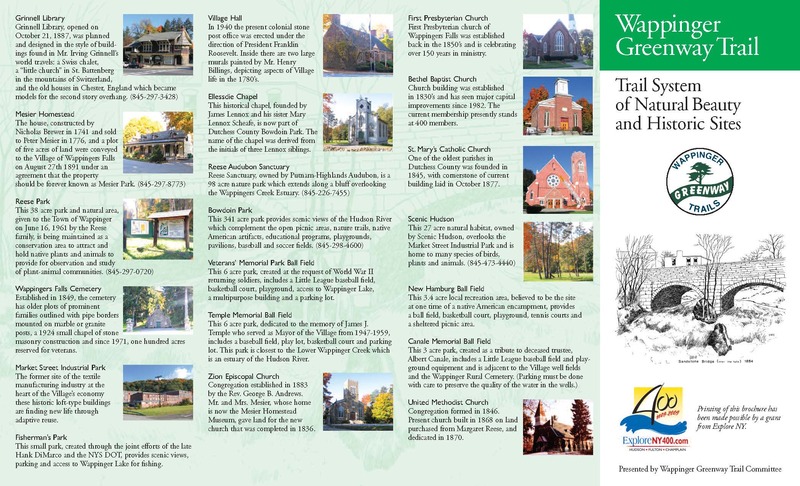 I am so super, super, super excited to be interning at the Wappingers Historical Society. 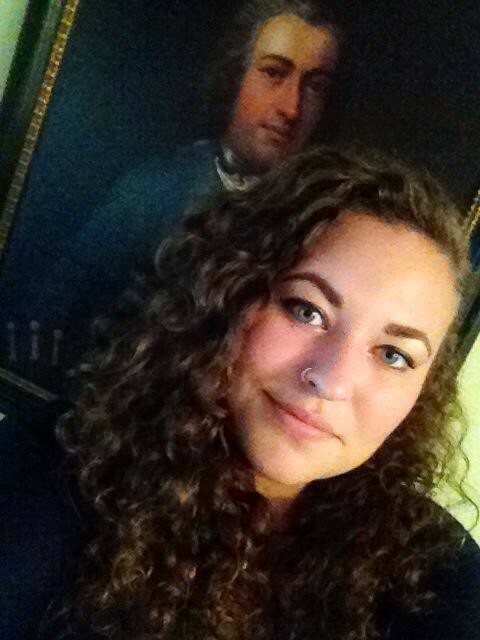 I have a deep passion for local history, and having the opportunity to get involved, hands on, with the society makes me incredibly eager to get going! Thankfully I didn’t have to wait long to get started (thank you, thank you, thank you!). The first few days I met with Sandra Vacchio, president of WHS, and together we ironed out the details of my duties as an intern. As it turns out, my internship will be totally awesome as Beth Devine, Vice President of WHS, suggested that my most consuming role would be fine tuning the society’s knowledge of the Mesier family. This means researching and gathering more information on Peter Mesier, the homestead’s namesake, and his kin. 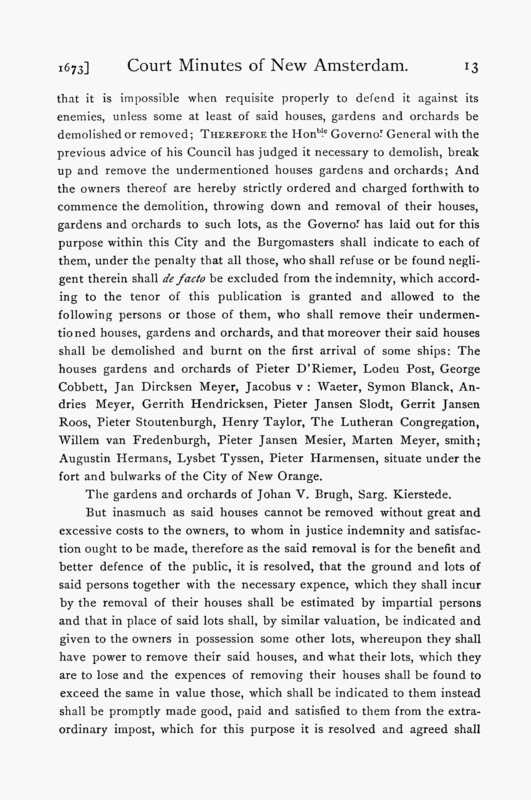 The project, it seems, is of immense importance to the progress of WHS as having a comprehensive history of the Mesiers, their role in the affairs Wappingers and earlier in New York City, would offer the society a firm foundation as to what exactly the long-term goals of the society would/could and should be. Beth has already given me a wealth of information to kick start my own investigations, and today I dove right into it. Then, to give myself a overall gist of the the Mesier’s history, I read Henry Suydam’s History and Reminiscences of the Mesier Family of Wappingers Creek. 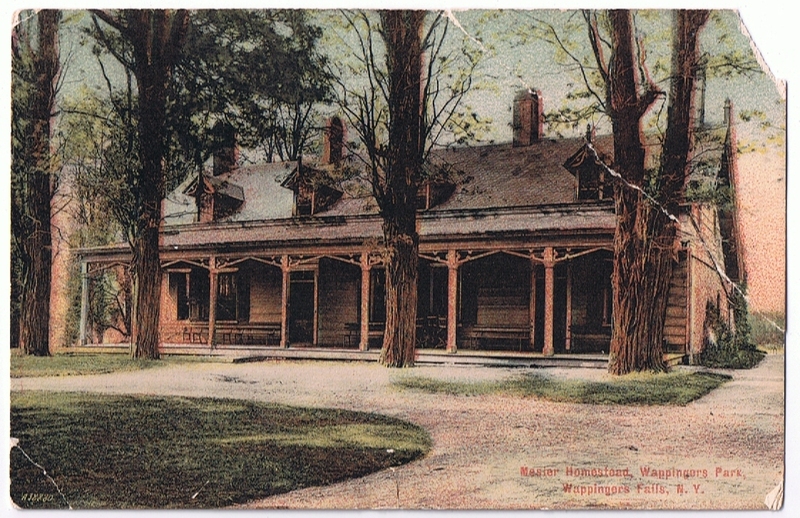 Henry Suydam was the son of Jane Mesier, daughter of Catherine and Peter Mesier, and frequently visted his Aunt and Uncle at the homestead. He privately published his History in 1882, the same year the last Mesier (Henry Mesier, I believe) occupied the house. The book is a brief, charming history of the the family and it’s more notable members. Though not thorough in the least, it was another great starting point. All in all today was a great, successful, rewarding first day at WHS. I feel like I gathered a lot of useful information and have the tools to formulate some more goals for moving forward – and I absolutely loved doing it. I feel like Sherlock Holmes. **I want to make a note that my blog will be structured as follows: each day I’ll post a brief description of what I did and my notes on each topic, and then at the end of each week submit an comprehensive, detailed entry of what I found and reflect on those findings.